Throwing a perfect Halloween party is a lot of work. Everyone is at their crazy best and as a host, you want to have fun too. But with all the planning, the running around and last minute party crisis, you can sometimes get too busy and worried, often killing our own mojo. We have a solution. Here’s a printable checklist for the perfect Halloween party. Whatever be your theme, if you print this and keep ticking things off one by one, you’re good to go. 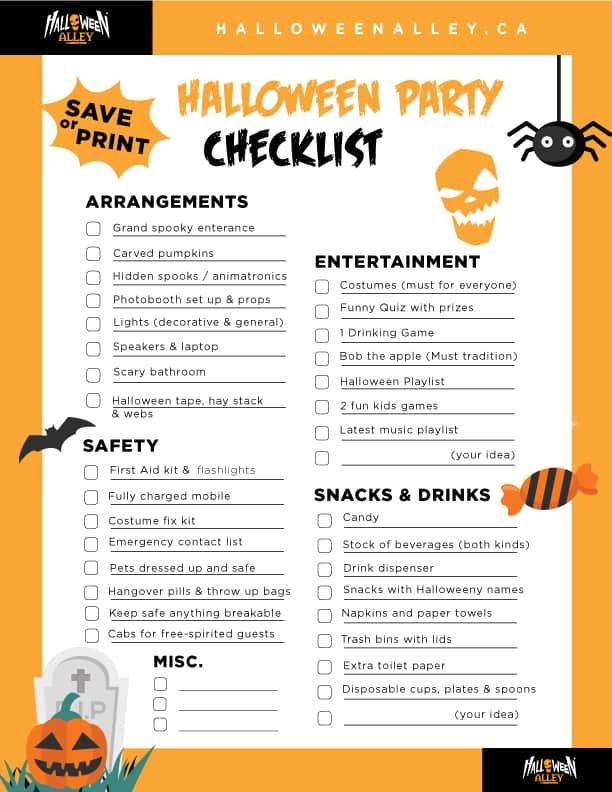 This little checklist touches every possible area that you need to look at for a bloody awesome Halloween party. Save the checklist in your phone or maybe print it, roll up your sleeves and get right to planning your party. Let’s assume you already have a guest list and have invitations sent out. Now, what’s left to be done? Decorations, entertainment, snacks, and drinks! Leaving aside any unique ideas for a theme party or a pre-party horror movie marathon, this checklist kinda takes care of everything. Here you go! You’re welcome 😉 And don’t forget the first step to a neat wicked Halloween party is making sure everyone comes in awesome costumes. Now, once you’re done saving the checklist, just in case you have some specific ideas on your mind you’ll find them all here. Sci-fi themed party snacks or superhero themed party snacks? Keep browsing, peeps! We’ve got a website loaded with evil wicked fun. And our store (g)hosts will be happy to help!